Since a long time ago, the Vietnamese have had engraved within their mind the image of a tranquil countryside having a banyan tree, river shore, green bamboo, thatched cottage, and a wooden bell of a pagoda during a sunset. Vietnam is a country of bamboo and rattan as they are able to grow quickly and vigorously anywhere. No one can pinpoint when rattan and bamboo made its appearance, but every Vietnamese has grown up with bamboo and rattan wares such as bamboo beds, rattan cradles… and their soul has been nourished with the legends of the rattan-growing king of Son Tinh mountain and Thanh Giong who pulled up a piece of living bamboo to annihilate the An invaders. Not only existing in legends, rattan and bamboo have been long used in production and in the daily lives of the Vietnamese. Under the shade of green bamboo, Vietnam has conserved a long-standing culture with bamboo helping in the building of houses, the reclaiming of wasteland, and more - with bamboo connecting closely and eternally with human life. Based on a finding at Da But (Vinh Loc district, Thanh Hoa province), an archaeological site with vestiges of the early stone age of about 6,000 years ago where was discovered an example of Vietnamese antique pottery displaying many bamboo weaving marks imprinted on the outside, could it be that primitive men did not use a turning table to make pottery but used bamboo weaving to make a mould and then put clay inside to make pottery? 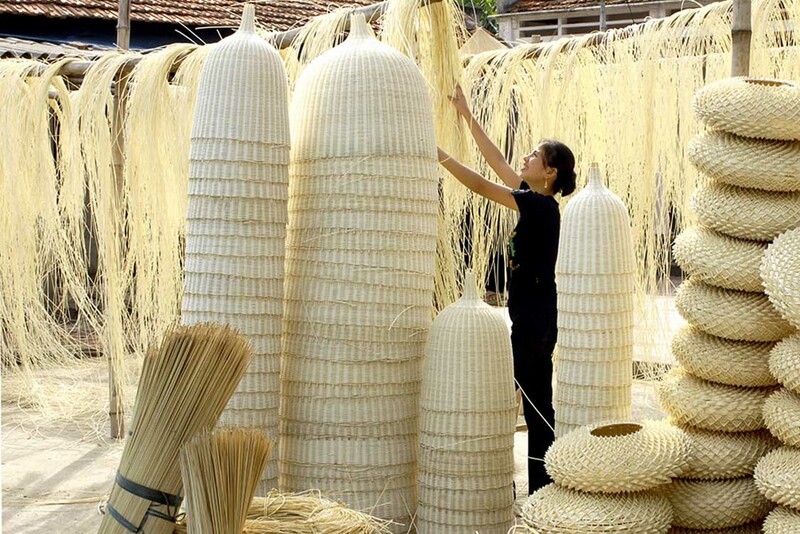 During the development and formation of the nation, bamboo and rattan wares always improved through the input of the many unique ideas of talented Vietnamese artisans who created quite an impressively wide range of exquisite aesthetic products. They served as papooses for young people on market days in mountainous areas and through a variety of production methods they were made into frames, baskets, large flat winnowing baskets, screens, mats, basket boats, etc as well as trunks, trays, chopsticks, plates, vases, tables, chairs, beds, pillows, cushions, mats, screens, and bamboo tape fans. Bamboo and rattan are also used to make a lot of souvenirs and keepsakes for wedding ceremonies, musical instruments very often displaying high artistic value. We are very proud to be able to say Vietnam is one of the most famous countries in the world for bamboo and rattan handicrafts. Closely related with the development of rattan & bamboo products are the many rattan and bamboo handicraft villages which have been formed. A staggering 713 rattan and bamboo craft villages are found scattered through the countryside, with each having its own characteristic. The most refined cane chairs are available at Son Dong (Ha Tay province, just west of Hanoi) and the Central provinces - including Da Nang, Quang Nam, Khanh Hoa, and Phu Yen provinces; vases, baskets, trays are produced at Phu Vinh, Ninh So (Ha Tay province), Tang Tien (Bac Giang province), and Thai Xuyen (Thai Binh province); carbonized products at Bac Ninh province; and Phu Tuc (Ha Tay province) serves as a major producer of bundle bamboo wares. Minority groups also preserve and develop their own bamboo weaving such as the steamed rice baskets of the Kamu people; cane chairs, cane salvers of the Thai and Tay ethnic minorities; flute chairs of the Nung; and rattan mats of the La Hu people. Not only is there a high domestic consumption of Vietnamese rattan and bamboo products in markets , shops and in further manufacturing, they also serve as important exports. The export market expands day by day with annual revenues attaining now over US $150,000,000. Bamboo and rattan wares attract more and more skilful and creative technicians, including many master crafts persons famous throughout the country.